​​ ​​DALLAS – Oaxaca Interests has started construction on a townhouse community west of downtown Dallas. The 16-unit project is two blocks from Sylvan|Thirty at 707 W. Commerce St. 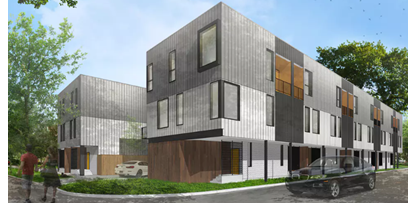 The three-story modern homes will have metal and wood exteriors. The townhouses will start at $324,000 and range in size from 1,380 to 1,510 sf. ​Check out DFW Housing Market Research.